I have been meaning to make a peanut butter and jam sriracha burger ever since I tried one in Scottsdale, Arizona last year. I actually can’t believe that I was so adventurous when I tried it; who would think that peanut butter on a burger is good? Apparently someone did and I am so glad to recreate the recipe here! When it came time to “think outside the jar” with Kraft Peanut Butter, I knew that it was time to try out this spicy, sweet and savory burger that had so amazed me a year ago. What I’m trying to get across here is that Kraft Peanut Butter can be used in so many unique ways. Sure, we all love it on toast – mine with jam as well- but there are many ways to enhance your favorite snacks and recipes with peanut butter. It’s not just a spread for toast, it’s an upgrade to your burgers and whatever you can think of. You guys, it works. The sriracha heat is dulled perfectly by the bold savory flavor of the Kraft Smooth Peanut Butter and the jam adds this sweetness that is unbelievable. The bacon adds salt and a fat to cut the spice as well. Will you trust Magpie? I want you to make this with your family and friends next time you have a barbeque- they’ll have so much fun with this. Don’t be afraid to use Kraft Peanut Butter on your burgers, or anything else for that matter. Can you tell that I am a peanut butter lover beyond measure? Peanut butter is good in anything! What I love is that you can add the sriracha to your own taste. 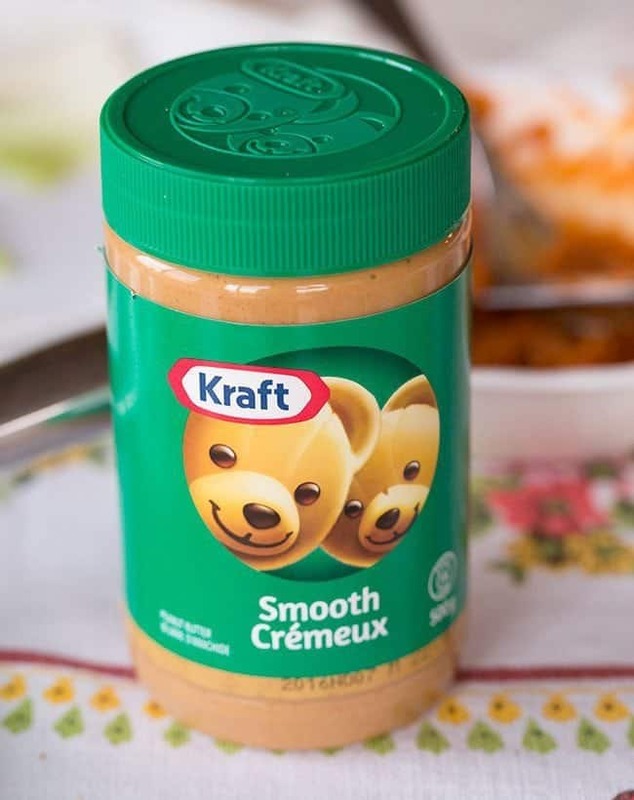 Mix it into the Kraft Smooth Peanut Butter until it’s the perfect pairing of spicy heat and savory peanuts. Then slather it all over your burger – this is the key part. You want the peanut butter to start getting all melty over top of the burger. I’m drooling just typing that. Then you add some jam – just a dab or two- on top. 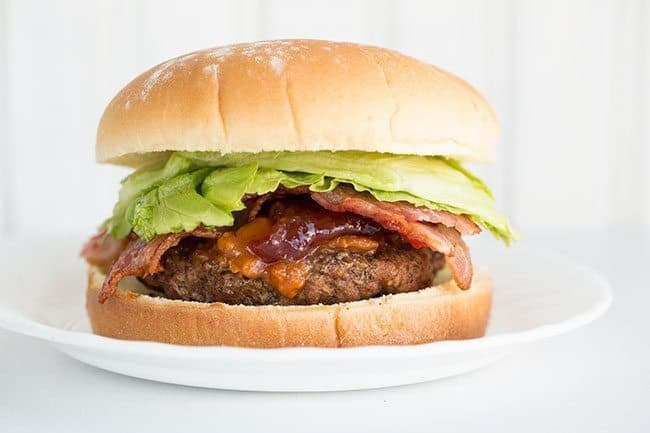 Pile some bacon on – lettuce if wanted but the original burger I tried didn’t have any lettuce – and top it with the bun. Love you more than peanut butter and chocolate together! Disclosure: Although this post has been generously sponsored by Kraft Heinz Canada ULC , the opinions and language are my own. Tantalize your taste buds with the crazy delicious flavour combination in these Peanut Butter and Jam Sriracha Burger! Combine the patty ingredients together in a medium sized bowl. Divide into 4 equal portions (this will be about 6 ounces each) and flatten into patties that are approximately 1/2 inch thick. Press a small round crater into the top of each burger with the back of a spoon (this helps them cook flatter, as you don't want to press on them while they are grilling). If you can, grill the burgers on the BBQ for the best results, 3-4 minutes per side until the internal temperature reaches 165 Â°F. Alternatively, you can cook the patties in a pan on the stovetop for 4-5 minutes per side, until the internal temperature reaches 165 Â°F. Mix the peanut butter and sriracha together in a small bowl to taste. 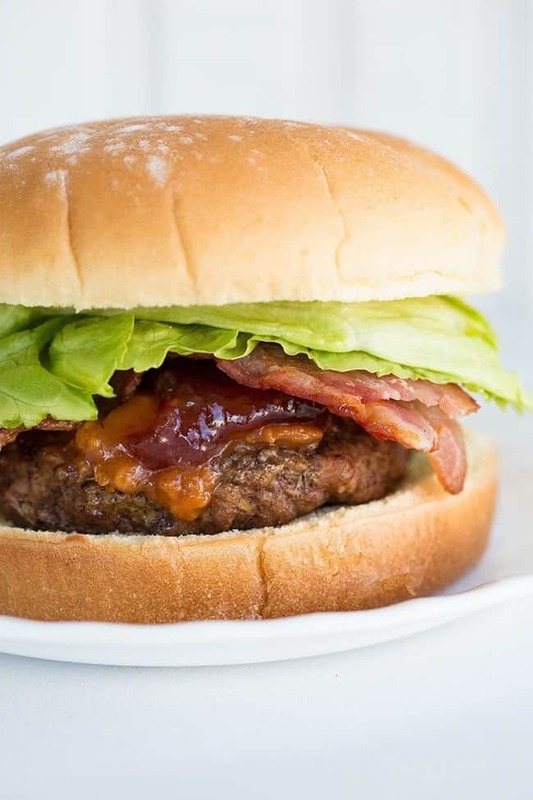 Build your burgers by placing the patty on the bottom of the bun, then placing a tablespoon or so of the peanut butter/sriracha sauce on top of the hot burger. You want the peanut butter hot and melty! Spread a tablespoon of strawberry jelly on top. Top with lettuce and the top of the bun. I wanted to tag you in this post. Stubborn as heck, you are! mrs.emilylynnesmith It is my favorite burger combo, bar none. Even my picky husband ate it! A miracle! Let me know if you try it and what you guys think!